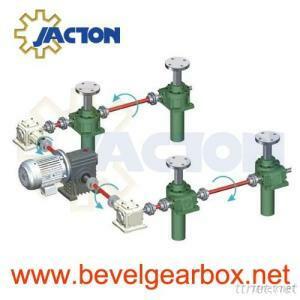 screw jack system, screw jack table, worm gear screw jack systems, screw jack adjustable height system, jack screw drive lift table structures include worm gear screw jacks, spiral bevel gearboxes, electric motor, gear motor or gear reducer, hand wheel or hand crank, pillow block bearing, flexible jaw couplings and connecting shafts. Load supporting capacity from several kilograms to heavy duty several hundreds tons. Self locking, precision positioning, full synchronization, multiple screw jacks systems arrangements, easy installation and operation, maintenance free. Two screw jacks system, L, I and T configuration, transmission efficiency 95%. Three screw jacks system, I and T configuration, transmission efficiency 90%. Four screw jacks system, H, U and T configuration, transmission efficiency 85%. Six screw jacks system, 2H and U configuration, transmission efficiency 80%. Eight screw jacks system, 2H and H configuration, transmission efficiency 80%. Notes: don't ignore bevel gearbox efficiency 98%. screw jack system, screw jack table, worm gear screw jack systems, screw jack adjustable height system, jack screw drive lift table application in coil feed lines, spray infeed conveyor lift system, theatre stage lifting platform, food processing oven lifts system, coil sheet slitter line, paint coating line, rewinding line, pickling line, cut to length line, electrolytic tinning line process, tension levelling line, continuous galvanizing line, beverage production line, continuous hot dip galvanizing line, continuous laminator line, metal processing lines and metallurgy industry, mining industry, chemical industry, construction industry, irrigation industry.